It’s our 7th Birthday in October and to CELEBRATE we have made another Limited Editions Smoothie Luxe Pack for October! The Healthy Mummy Limited LUXE SMOOTHIE PACK is packed with some Healthy Mummy items that we know you love! What’s in The Birthday Luxe Pack? 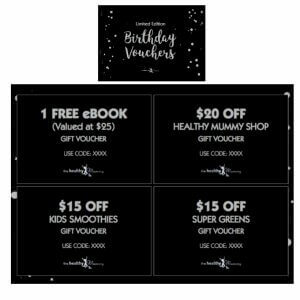 Get your birthday Healthy Mummy store vouchers in your LIMITED EDITION LUXE bag and save on shopping! SAVE $75 worth of SAVINGS at the Healthy Mummy.